No, not the SI cover! OK, avid sports fans in Central New York and Pittsburgh. 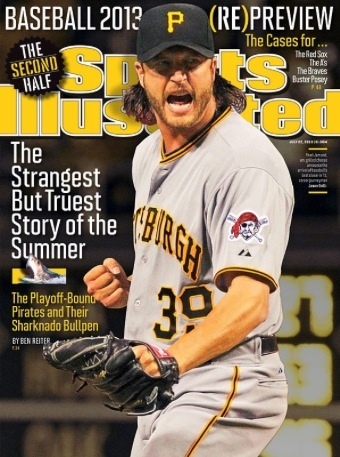 When surprise star closer Jason Grilli turned out to be the cover boy for last week’s Sports Illustrated, don’t tell me that among all those yee-hah’s dancing around your brain there wasn’t a small uh-oh hiding out. The SI cover jinx lives. The 15-day disabled list label when this latest pain appeared in Grilli’s return after the All-Star game may turn out to be optimistic. The new news says he’ll be out indefinitely. No surgery, but rest. Plenty of it. At least everybody got to enjoy Grilli’s excited dugout interview and one-inning of work among baseball’s finest before the notorious SI jinx clobbered him. Does a major league player deserve paternity leave? I hope he’ll be ready for the playoffs … it’s nice to see the Pirates back in contention, and Grilli’s been a big reason for that. (I think his agent is Gary Sheffield, who had a lot to do with Grilli’s resurgence). I hope Jason can get back on the mound to help the Bucs make the playoffs, too, Jim. It’s fun when a franchise rediscovers its proud tradition.